Alan Pardew has revealed that both Fab Coloccini and Cheick Tiote were not really fit enough for a Premier League game yesterday, but he played them in any case, and we are just pleased they both seem to have come through the game uninjured. Fab Coloccini in particular we thought had a strong game, given it was his first game back after his long lay-off with a knee injury since New years Day. And Cheick will be a lot better after getting 90 minutes under his belt, in what turned out to be a fabulous win for the club. 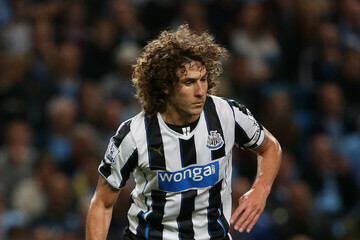 There’s no doubt that Colo is a huge player for Newcastle, and he keeps things calm at the back. and leads by example both on and off the pitch. He’s a player we need to keep at the club for the next two years of his contract, if Newcastle are to have any chance of mounting another attack on the top six in the Premier League. We don’t know what the personal situation is currently with Coloccini, but we just hope he can see out the remainder of his contract on Tyneside – through the summer of 2016. Sad to see so much negativity knocking about despite the win. An underwhelming performance, of that there is no doubt, but given the run we had been on, and the lacking of confidence evident when we didn’t turn up against Spurs this was a good way to bounce back. Nerves were evident from the pitch to the stands, but both a clean sheet and a win are very welcome. I get people are disappointed by the overall performance, but a win is a win, and on the back of the run we have been on I’d take a scrappy, late one nil win any day of the week. I just hope it gives us a kick start. 100% with you on that…cant go from getting a drubbing to outplaying opponents and hammering them in the space of a game, it’s very difficult to do when you have been on such a bad run…it stops the rot and gives us something to build on next week. I don’t think there is any excuse for cisse missing his chance, he should have burried it, remy too. We still did ok, nothing special but a decent bit of play at the odd moment. to build on next week. Good 3 points yesterday. Only caught the highlights last night as I was working, but seemed to be a good enough performance considering the past few weeks. At least something to try and build on. I see Pardew has been doing the same transfer kitty maths as us. As always though, it will be interesting to see what the board does. If we want to try and attract some half decent players this summer, a strong push towards this seasons finishing line will be needed. How did De Jong play when he came on, looked pretty decent from the highlights, but they can often give an obscure view of a game? Reaching Europe? No – That ship has sailed. 3 points on paper to help Ashley collect his money graciously and with a smile. We may well have lost or drawn, what difference would that have made? again people relying on internet to cast judgements. I get that, but can’t underestimate the impact of confidence and form. Just breaking that losing run should see confidence boosted. If we are still playing very poorly by the time the Palace game comes, regardless of results, then it would be more worrying. As it is, hopefully we can kick on from here and pick up our game. I think that playing Remy and Goofy off LDJ could well reap rewards, so I am hopeful that is what we do from now on. Lilongwe Geordie @1 – I agree completely. You can’t expect to come off the back of 3 defeats and play magical football. It was always going to be a tense nervy affair and people who expected anything else are just unrealistic. When our tails are up then yes I expect some free flowing football such as away at West Ham. HD…I suppose it all comes down to your view point or what you want to achieve or what you hope the club to achieve. If we think about this summers window, pushing as hard as they can and finishing as high up as possible will perhaps give the impression that we’re a club worth joining. If we simply give in, it’s pretty much game over and next season will be one long old slug. Then again, that is assuming we’ll actually try and get any decent players in…that didn’t take long. I need a drink. I accept your premise but not the logic. Winning all games under “Pardon no clue” is a bad assumption to make. What difference does the win make? Well as fans I’d imagine all (most, maybe one or two exceptions) would prefer to watch their side, whoever that may be and in whatever sport, win. Yeah, very little chance of relegation, very little chance of Europe, but I’d still rather watch NUFC win than lose. I find it odd that any fan wouldn’t prefer their team to win. HD & Tudor…Were those comments directed at me? Transfer, he should have buried it, yes. If a happy child is bullied and harrassed he may then be anti-social in groups in the time following. Should the child be ok because the group is a nice group, or is the child’s state affected by the way he was moulded in the harsh treatment before? Plus, he was hardly served up lots of chances was he? He’ll get rustier just from playing in many ways. Once the system favours attacking players. Attacking players will favour the system. Mine was! as a reference to dennis wise scouting on you tube. Yeah, it is a big if, but most things to do with Newcastle United have been that way for as long as I have been alive!! I’m not a fan of Pardew, and would happily see him replaced, but I’m realistic enough to realise any win yesterday was a good win, and desperately needed. Hopefully we will build on it, maybe, and some would say unlikely, we can go on a good run. Anyway, that was the reason why I pointed that out and directed my comments more as a question, as I’m aware highlights are not a good way to gauge a game. So we have to take on board poor performances now, simply because of the poor performances before? This fabled 10th aim is already a dictator led lowered expectation so it is easier for the slimey one to achieve. We play poor football with good players. If that doesn’t tell a story then I don’t know what does. I really like the majority of our players. That is down to Carr, not Ashley. Ashley on tightens the grip on the finances to just above suffocation level. He did OK I’d give him 6.5 out of 10 His movement off the ball looks very good and spacial awareness also very good drops in spaces to pick the ball up. His running and closing down led to Rem’ys chance he hit the post. Drawback looks lightweight may need a few Mackytans/Guiness’s to build him up. Midfield poor kept giving the ball away except Goufron who covered every blade of grass. Krul one decent save but oh/dear his distribution is poor and selection of picking player out to slow bak to hoofing it upfield. BUT Hull not going to be easy and have not beat them for over 20 years. I understand all the doom and gloom around at the moment but if you can’t be cheerful after a win, at least for a couple of days then what is the point of supporting NUFC? Charlie…Thanks for that. It was always going to take De Jong a while to settle. Shame about the offside yesterday, a goal could so the kid the world of good. Have we really not beat Hull in over 20 years? Shocking. Oh well, no time like the present. I agree, as with Dummett yesterday, the remainder of the season is a good opportunity to allow the kids to have a run out (not all at once) so we can see who is realistically up to the level required of first team/squad members next season. No, we don’t have to accept poor performances, but when you are on the back of a bad run like that, it is unlikely you will put on a sparkling display. As I have said, now we have that monkey off our back we should expect to start at least trying to play better football. I’m not saying I think Pardew can give us that, but bashing him for yesterdays performance is a tad unfair. i cant agree on the lowered expectations either as i think most on this blog at the begining of the season said top10 aim when we did not sign anyone “again” but we highered them as fans when we started to do so well ! now we weaker again maybe we have lowered them again but not to lower than where we first was. Well, it’s been short but sweet. Catch you lot later no doubt. martoon, support doesn’t just come in the form of blindly happy clapping the poor performances. Support comes in all forms. Should I reward players with seal-like clapping when there is no movement when a player has the ball, or should I highlight that there is no movement? The full-backs have the best movement on the pitch, followed by Cisse trying to make runs in behind (but there’s no Cabaye/Marveaux to make the pass). The full-backs generally follow a straight line of attack, so for them it’s a lot easier as they’ve been doing the same thing for years. A relatively manager-less task. On Remy, I think that is fair. If we can give a youngster a chance, Asthma, Campbell (obviously need to bring him back from loan), if Gillihead has toughened up a bit, maybe even him (recently made his England U18 debut I think). Alternatively, as we apparently have a buying option on LDJ say to him, this is your chance as main striker. Take it and you could be a hero here.